As we age our skin thins and our collagen levels decrease. To some extent it is part of life, the same way our hair may turn grey or white, thin skin will eventually happen to all of us. Why and how our skin changes is related to environmental factors, our genetics, how and what we eat, as well as other factors. One of the greatest single factor, is sun exposure and why we always say that the best skin care product for anti-aging is sunscreen. What options do we have to help with thinning skin? 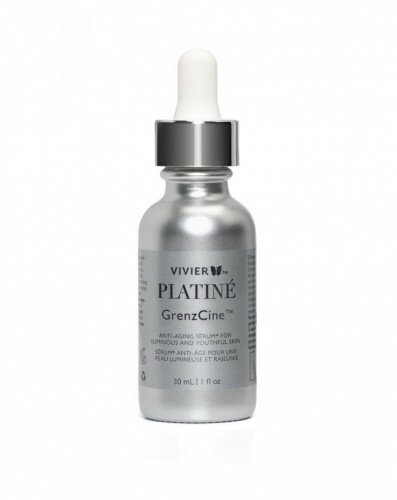 There are many different products that can help and one of the latest discoveries is the serum, GrenzCine™ from VivierSkin. GrenzCine™ Serum is formulated to help increase the firmness of the skin and help to thicken it. This serum also combines the VivierSkin, patented Vitamin C sērum with Polyamine-DAB™, a new patent pending discovery resulting from 30 years of clinical research by board certified plastic surgeon, Dr. Kenneth Dolynchuk from Winnipeg. GrenzCine™ Serum will help to increase firmness and hydration of the skin while diminishing fine lines and wrinkles, helping to increase luminosity, improved skin tone, texture and elasticity. It is oil-free, alcohol-free, hypoallergenic, non-comedogenic, dermatologist tested, recommended by physicians and clinically proven. VivierSkin is one division of the pharmaceutical company Vivier™, an innovative pharmaceutical company committed to providing superior skincare solutions that change people’s lives by delivering results. This exceptional mission was achieved through years of dedicated research and development into innovative skin care technology designed to give the most visible anti-aging effects. Their passion to enhance beauty from the inside and out is what drives them to continuously exceed expectations and to be the best in the industry. Vivier™ is proud to be one of the fastest growing pharmaceutical skin care companies and trusted by Dermatologists, Plastic Surgeons and Aesthetic Physicians worldwide. We have been carrying Vivier™ products including Platiné and SkinTX since Etiket began in 2011.